The industry is changing… Rapidly! 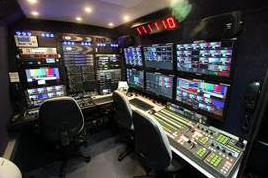 Television News departments still have a wide array of news gathering tools at their disposal but less used are the large ENG/SNG’s to cover live news events. Sure stations still have a few larger trucks, but the industry is shifting to smaller vehicles to gather the news and send it back wirelessly. Accelerated Media Technologies has been fabricating Electronic News Gathering (ENG) trucks for many years (building more than our competitors combined), so we have a lot of experience we wish to share. We invite your thoughts on this topic, or any other you’d like to discuss. For many years, these dependable ENG’s built on van style chassis have done the heavy lifting for TV stations. 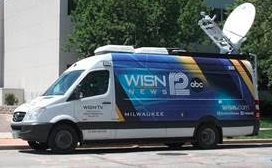 With their on board generators, pneumatic masts, roof top air conditioners, stabilizers, and a host of other essential equipment, broadcasters can get live shots back using microwave transmissions. This technology works well but must transmit from the top of the mast to a receiver on a tower to eventually get to Live Ops. If the operators get beyond the range of these towers, or lose line of sight, the MW doesn’t get the job done. To provide a solution, we offer a vehicle known as an SNG which replaces MW with a Satellite system which enables news coverage over an unlimited range. These SNG’s are able to send and receive broadcast signals from almost anywhere, but the equipment and service packages are expensive. 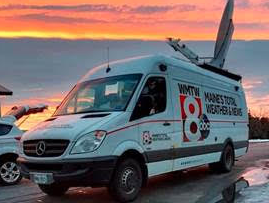 Technology has been migrating to Bonded Cellular IP Streaming for several years, with live news gathering vehicles sending their data over the Internet to communicate with the station. Bonded Cellular uses modems in a backpack or in the truck to aggregate multiple cell connections simultaneously, sending separated packets of data over several paths which then reassemble at the station seamlessly. These backpacks and “IPNG” vehicles provide a reliable, affordable, practical, and user-friendly means to gather live news, and are rapidly becoming the norm for News Departments. While IPNG vehicles succeed most of the time, if cellular towers are swamped with cell phone data (like during a major event) or if the reporters’ location is out of range of those towers, Bonded Cellular performance decreases significantly in which case the bonded cellular equipment will increase delay to improve on error correction and therefore shot stability. In such instances, operators having the new Hybrid Ka/Bonded Cellular IPNG vehicles can now rely on smaller Ka Satellite systems to augment cellular performance. Accelerated Media Technologies (AMT) working with ViaSat and Excede developed the first application of Bonded Cellular using Ka band Satellite systems. This package enables the truck to automatically choose Cellular if available but when the cellular service begins to degrade, the system automatically begins backfilling the data stream using the Ka path, at which point the stream is re-combined at the TV station and turned back into baseband HD/SDI. The cost of Ka satellite equipment and monthly service is cost effective and since it provides exceptionally high assurance of producing a successful live shot, News and Engineering are able to justify the need for IPNG vehicles in the station’s News Gathering Toolbag! A huge plus, is that it’s extremely easy to use; one button press deploys the dish and configures the connection. There’s no need for the photographer to stay with the vehicle while the connection is made; they can be about their business shooting the story. Another recent addition to the Bonded Cellular and Satellite system approach is the use of Ku band to transmit the satellite portion of broadcast data. Since Ku has a longer wavelength than Ka and can use more powerful amplifiers, it has the ability to transmit through inclement weather better than Ka, but that comes with overhead. The initial investment in Ku equipment is much higher, however, it’s the monthly service costs that are many times more expensive than Ka. Plus, Ku bandwidth is fairly narrow restricting how many users can be “on the bird” at the same time. For most stations, using a .75m Ka dish is all it takes to transmit the digital data stream coming from the camera, even during rain. After all, transmitting data verses transmitting actual video requires a much narrower pipe. 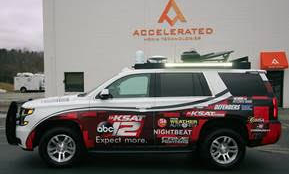 AMT has seen a sharp increase in stations acquiring Weather Chaser vehicles. The trend is towards very impressive vehicles with big tires, lift kits, massive bumpers, and incredible graphics. 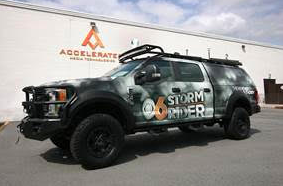 Of course, these Storm Chasers also have full broadcasting equipment and connectivity using cellular and Ka. Besides the ability to return live images as the vehicle rolls along, a built-in Weather Station enables the reporter to broadcast live from the site using a large external monitor to show the local weather. These vehicles are typically used to promote the stations’ image so are often taken to schools and other community events where it will attract attention. 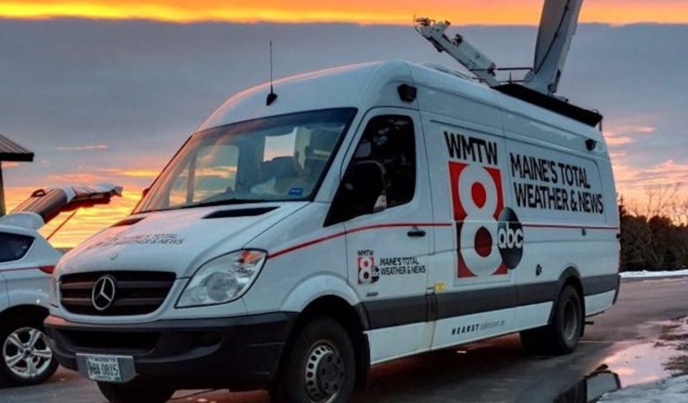 The Weather Chaser truck is another tool both the stations’ News/Weather Departments use, but also the Marketing Department. 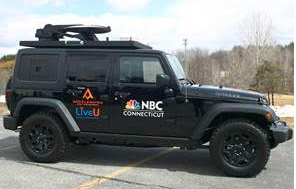 Accelerated Media Technologies is a major producer of broadcast vehicles, but also builds highly customized vehicles for national and international government use, plus a wide range of specialty vehicles for commercial and industrial users. We invite persons interested in learning more about what we do, to contact us for discussion. Please contact us at 508-459-0300 at your convenience.